The technology side of mining. The characteristics of AMD, NVIDIA cards, algorithms of mining, description of work of mining farm, software for mining, what to choose Windows, Linux or OSX for mining. All about mining. Due to popularity growth of Bitcoin at the end of 2013, the mining difficulty has increased for many times. This was also caused by the fact that many large investors began to buy ASIC equipment for Bitcoin mining on an industrial scale. It all led to the fact that SHA-256 crypto currency mining without special equipment ceased to be profitable (Bitcoin is the most profitable crypto currency based on SHA-256 algorithm for mining). For comparison, one ASIC unit on average had a capacity of 600000 Mh/s, and the most powerful GPU - ~850 Mh/s. This is why the mining of the scrypt cryptocurrencies started gaining popularity. The scrypt mining or GPU mining is not like Bitcoin mining because of algorithm differences. For mining of Litecoin, as well as its various forks on the scrypt algorithm, this article will discuss the important technical characteristics, as well as hardware compatibility, software and the most popular software – the miner, in particular the most stable and flexibly configurable CGMINER. 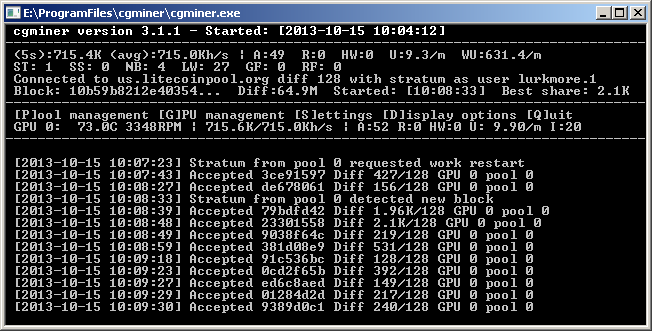 Now let’s make it clear the why graphics card (GPU) fits scrypt mining better than the central processing unit (CPU). The processor (CPU) was developed to make decisions according to the programs’ directions. Also, the processor performs a great number of other operations. The graphics adapter (GPU) is able to carry out many similar tasks very fast and effectively, but at the same time it switches to another task slowly. One CPU core executes 4 32-bit instructions per clock (SSE) or 8 32-bit instructions per clock (AVX), whereas a Radeon HD 5970 GPU is able to process 3200 32-bit instructions per clock (using its 3200 ALU or shader unit). 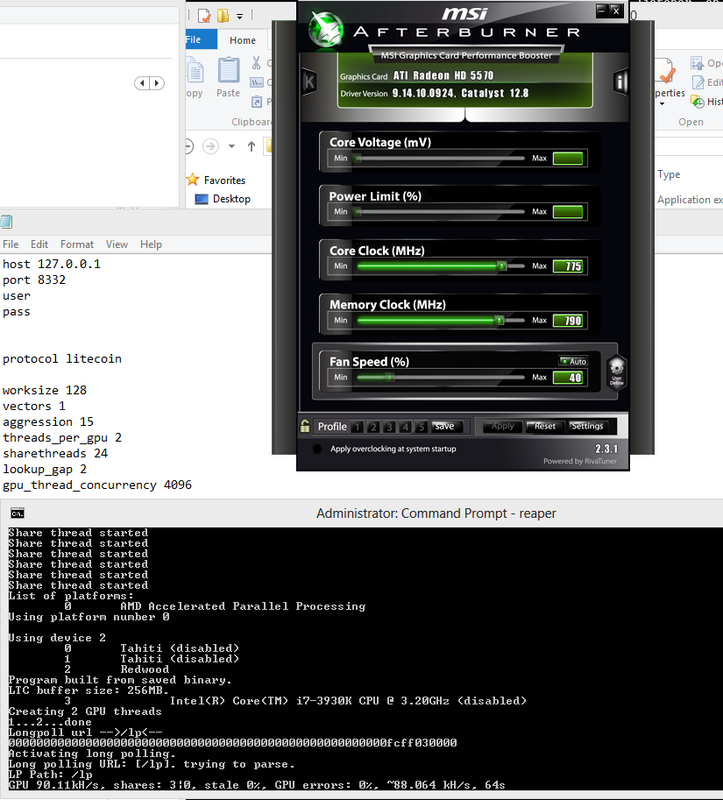 It turns out that in this example a GPU can process 800 (or 400 (with AVX)) times more instructions per clock, than CPU. Even despite that since 2011 the CPUs have been produced with 6, 8 and 12 cores and clock speed of nearly 2000-3000Mhz and more, a Radeon HD 5970 GPU (with clock speed of 750 MHz) remains more than 5 times faster than four 12-core CPUs with clock speed of 2.3 GHz (while the price of the latter around $4700, in contrast to $350 for HD5970). NVIDIA graphics adapters, due to their design features, are currently less capable and make farm building several times more expensive than with AMD solutions. For comparison – the most capable NVIDIA graphic cards have a capacity of ~150 Kh/s, AMD has 1500 Kh/s. But NVIDIA has a “Tesla S2070” card, which gives 700 Kh/s, however its price is $1360 against $510 for the most powerful cards by AMD. Motherboard. It should not be cheap and have 4 or more PCI-e slots (for graphics cards). Processor. Its capacity is not needed for the scrypt mining of Litecoin and its forks. This is why the cheapest one is chosen, which fits the motherboard. DDR memory. Size from 4Gb, the simplest and cheapest one. Hard disk drive. Doesn’t play any role. It is needed to install the OS and to store wallets, so a simple flash stick fits. Power supply. The main engine of the whole farm, so the choice must be done carefully and without hasty conclusions. The power supply capacity should be chosen with a margin of 150-200 watts, considering the power consumed by other components except the graphics cards. Graphics card. The main and the most expensive component of a mining farm conducting calculation of hash functions of the blocks. Specifications and speeds of many graphics cards are displayed by users in tables on various portals. Here you will find links to them. Cooling system. It must be well-designed to move the hot air away from graphics cards. In order to do this, the space between the graphics cards must be no shorter than ~8cm. Also, a water cooling system can be used – it cools the graphics cards better and doesn’t produce as much noise as air cooling, but is more technically complicated. Of the most sophisticated cooling system variants, we can empathize the oil cooling when all the hardware is fully submerged into a reservoir with technical oil (some “craftsmen” submerged the components into vegetable oil). An example of definition can be seen in this article . There are currently a great number of graphics cards on the market, which suit for mining. The largest list of these graphics cards is available on [litecoin.info]. Here you can see the basic data of the mining: graphics cards’ specs and settings, but all of them are conditional, because every farm is being set up individually and depends on a great number of factors which will be considered below. Some graphics cards are already deprecated and they are impossible to find in the necessary number and condition. We will discuss graphics cards which are available on the market, as it will give an opportunity to make a mining farm of a necessary capacity. GPU mining, as well as the farm building, doesn’t have standard solutions, so your results on achieving the maximum capacity and stability depend on many factors, which are listed below. The selection of optimal parameters of memory clock speed and core clock speed must be done individually for each graphics card. These parameters affect both the mining rate and the whole system stability. Also, overclocking affects temperature and energy consumption of the graphics cards. The more is the GPU overclocking, the more are the farm demands for the cooling system. If the system has different card series, or cards of one series but by different manufacturers, conflicts are possible during launch and overclocking, which will affect the maximum speed and the whole farm stability. 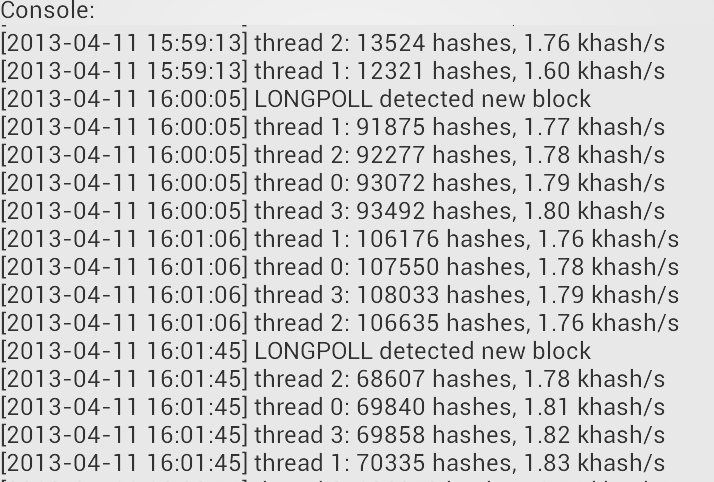 Hardware combinations for a farm also affect the hash rate. A correct choice of farm components like motherboard and RAM also increases the stability and the mining speed of a farm. For example, as said before: the lack of standard solutions in scrypt mining leads to the fact that the same values and settings of the video adapters are often ineffective when applying to another farm configuration. When building farms, one should do some calculations to know the most profitable variant. It’s necessary to calculate the total cost of the farm, choosing the most profitable components by profitablility and energy consumption. You need to know energy consumption of the whole farm and calculate 24 hours charges for energy. Considering these calculations, you can draw a conclusion on the payback period. To make this task easier, there are many mining calculators: from simple ones, which consider only the crypto currencies’ exchange rate and farm speed, to detailed ones, which consider exchange rate, speed, energy consumption, 1kWh, difficulty and exchange rate changes during the time. There are companies that provide their equipment capacity for a certain amount of money per month. This way is relevant for crypto currencies, which have only CPU mining. It is profitable in two cases: when the company provides a free trial period, or when the crypto currency complexity is low and the exchange rate is high. Operating systems and mining software. OS installed on the mining farm may affect the crypto coins mining speed. Popular OS for large mining operations. Small miners usually prefer Windows 10. There may be difficulties for a beginner when using for the first time. If you install the OS on a flash stick, it’s difficult to store big wallets. The right driver version choice is very important. Sometimes particular driver versions lower the total computational capacity of the scrypt mining equipment. 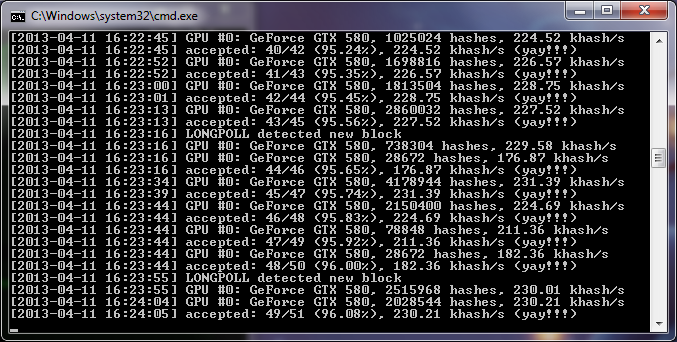 At the same time the others, on the contrary, allow to achieve high hash rate. APP AMD SDK version must be 2.6 or higher, you can download an update for your system from the AMD official website. There are several main mining programs - bfgminer, ufasoft miner, diablo miner, phoenix, guiminer, cgminer. The most flexible in configuring, stable and informative miner is CGminer. So we will discuss it. 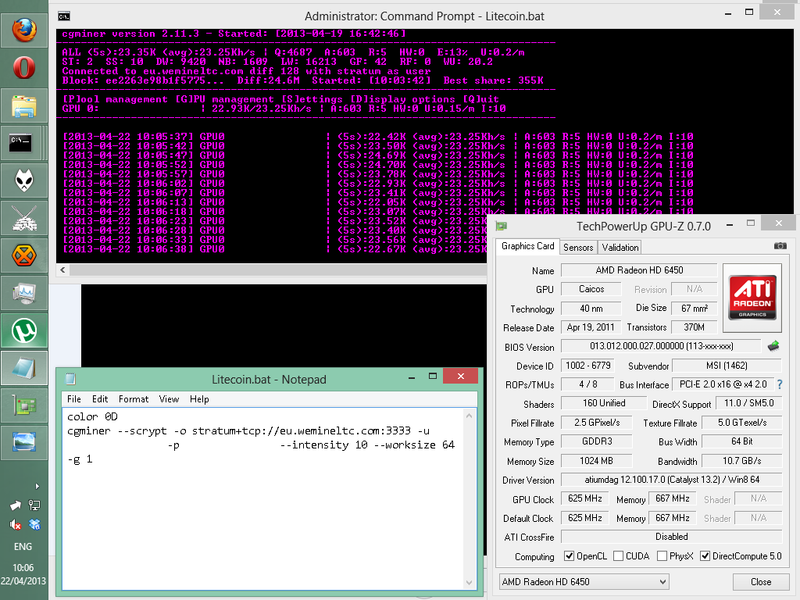 -o – after this, a pool address is specified stratum+tcp://east1.us.stratum.dedicatedpool.com: and a port 3351. This data can be found at all the pools, in "Getting Started" section. Advanced settings to enhance the miner’s performance. --worksize (-w) Set the memory size, barely affects performance (default: auto, the value must be a power of 2 - 64, 128, 256, 512, 1024, 256 is recommended, example: --worksize 256). Intensity is the key figure affecting the miner's work speed, its value is set from 0 to 20. One must consider that a too high intensity can negatively affect the mining speed, because it MAY exhaust all available memory and actually reduce the mining speed in the best case. In the worst case – there will appear a lot of miscalculations and HW errors. Take into account that if the intensity is not set, CGMiner will adjust it itself, dynamically, to provide an opportunity of convenient work with the PC. Thread-concurrency controls an optimal volume of calculations which a scrypt algorithm can do. It is set up by default to use a few threads on all shader blocks the graphics card has at a maximum. The value must be a multiple of the number of shader blocks of the graphics card. So, if «thread-concurrency» is specified, «shaders» may be removed. It is recommended to spend some time to find the best value for your graphics card in order to get the best performance. Since AMD is producing R-series cards now we will consider R9 series as the main for the review. Because it is the most economically profitable considering the PRICE / ENERGY CONSUMPTION / CALCULATION CAPACITY. A drawback of the reference R9 290x and R9 290 was card cooling without any additional cooling while mining. They heated up considerably, up to 90-100 degrees, which is not acceptable for 24/7/365 mining and forced the owners of such farms to either mod the cooling system of the graphics card, which did void the warranty in some cases, or organize the ventilation and air conditioning system. Thus, the increasing costs and payback periods appeared. But today there are quite a lot of non-reference solutions from almost all manufacturers, which made R9 290x and R9 290 very interesting for building powerful, compact and cold enough farms. To date, the majority of miners consider the golden mean constructing farms on these video adapters. This series will allow a powerful, middle-sized farm. Also suit for constructing farms on their base. But this will be the biggest farms in size and the number of connected wires. On their bas, an additional number of risers will be required, which are additional expenses. Below, there are some statistic data about the performance of various mining equipment. The columns are sorted for the comparison convenience. C – video processor clock speed, M – memory clock speed, V-voltage, W- energy consumption. The graphics cards of this series are low-powered with the speed up to 200 kH/s. The energy consumption is low. But it is unprofitable to build a farm of them as a big number of them will be needed, which makes the construction of the farm money-losing despite their low cost. The capacity of the card in this series varies from 300 to 450 kH/s. The energy consumption is a little bit higher than at 5700. Small farms can be constructed of such graphics cards, for example, for an acquaintance with the mining sphere or small additional income as they have a low price. These are powerful cards with the speeds 700-800 kH/s. In capacity, they can compete with 7900 series. Uses much more capacity than the previous 2 series - ~300 watts. The average price is 11,000 – 13,000 RUR. Low-powered cards, the speed is up to 230 kH/s. The energy consumption is low, up to 150 watts. The average price is 3,500 RUR. The average capacity is 200-350 kH/s. The average price is 5,500 RUR. The energy consumption is up to 200 watts. Cards of medium capacity of 400-500 kH/s, excluding the graphics card 6990 that has the speed of 800 kH/s. The energy consumption is high, 230-400 watts. 6990 uses 430 watts.The average price is 10, 000 RUR. This makes them unprofitable as they use as much capacity as faster cards. The speed of the cards in this series lies in wide limits from 40 to 270 kH/s. With the energy consumption up to 150 watts and the price up to 6000 RUR, they are much more profitable of the low-powered cards described above. The capacity is 350-500 kH/s. The energy consumption is 130-220 watts. The average price is 10,500 RUB. They are also unprofitable in the light of the cost/capacity ratio. Graphics cards of this series are popular in mining, especially 7970 that in capacity is similar to R9 280 series. Big capacity of 600-800 kH/s, big energy consumption 250-350 watts, the cost is 13,000 – 16,000 RUR. The further price growth is possible due to the growing popularity of mining. The newest graphics cards by AMD. For calculating the tasks, 2 cores are used in them. So, when installing 1 card in the farm, it will be equal to 2 and there, where 6 graphics cards could be installed, no more than 3 such monsters would be installed. The largest ones in size. The highest speed among all existing graphics cards - 1100-1500 kH/s, the biggest energy consumption – 450-500 watts. The price is ~ 35,000 RUR. In some online stores it may reach 50,000. Due to such characteristics, the payback of the farm with such graphics cards will be long. They are profitable with a free use of electricity. At the moment they are the most popular graphics cards among miners due to the best price /capacity ratio. The capacity is 570-800 kH/s. The energy consumption is 250-330 watts. The price is 15000-18000 RUR. The price increased recently due to a fast growth of demand for them. It is difficult to find them in stock. The third most popular series after r9 280 and 7970. The capacity is 750-1000 kH/s, with the energy consumption of 250-470 watts. The price is ~ 20,000 RUR. According to the users of these cards, their cooling system is worse than by younger series, which is why when building a farm with such cards, it is necessary to construct a good cooling system. The graphics cards by this brand are extremely unprofitable for mining as with the similar cost to the equipment by AMD, they have a much smaller capacity – 500 kH/s maximum. In this regard, such graphics cards don’t enjoy popularity among miners, which is why they are sorted below by capacity only. The mining with the use of the CPU capacities is essential only on some crypto currencies where the CPU mining is possible. The main such currency is QuarkCoin. In all other cases the CPU mining is not essential as the processor capacities are even less than by NVIDIA cards. Let’s view the processors by AMD and Intel. Here, AMD loses in capacity: the maximum capacity of AMD processors is 65 kH/s against 130 kH/s by Intel. Mining with the use of the CPU capacity is relevant only in some cryptocurrencies, where possible, only CPU-mining. The main such currency is QuarkCoin. In all other cases, cpu-mining is not relevant, since the capacity of processors is even less than NVIDIA cards. Core i7-860 25 153 2.80 4 (8 HT) pooler's cpuminer Gentoo x64 CFLAGS="-O3 -msse2"
Core i7-2760QM 38 2.40 4 (8 HT) pooler's cpuminer Ubuntu 11.10 x64 CFLAGS="-m64 -O3"
The maximum of the mining facility of laptops is 360 kH/s. This is why such mining is not profitable. The information in the table is sorted by the capacity ascending. Here are the capacities of smartphones, cloud servers with CPU capacities and other low-powered equipment. The information is presented for your guidance as the mining on such component is pointless. According to the above-stated information, we can make the conclusion about the most profitable way of the scrypt mining at this moment. "Hardware". Graphics cards by AMD are nowadays the most powerful ones in the mining sphere. Recently, the nVidia Company announced the release of the new graphics card that can compete with AMD. AMD doesn’t stand still though and in the nearest future it will outstrip nVidia by its capacity. Software. The most flexible in settings and informative mining program is CGminer.It also has a modification for various hashing algorithms. CPU mining.Is essential when another mining method isn’t foreseen by the crypto currency algorithm (quarkcoin). CPU mining can be set on the cloud servers that provide capacities of some number of processors. This page was last modified on 24 September 2018, at 07:45.